Growing up, I hated coconut with a passion. 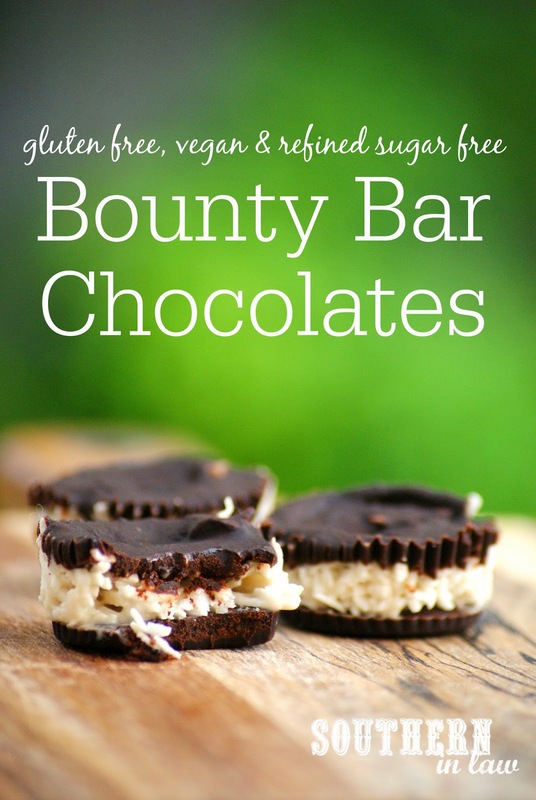 I cringed watching my Dad eat Cherry Ripes or Bounty Bars because I felt like they were the world's worst chocolate bars as they were sickly sweet and filled with way too much gritty coconut. As I got older, however, coconut became something I loved - to the point where coconut became something I craved. The rich, creaminess of coconut milk and the scent that takes you straight to the tropics - I went from a coconut hater to a certified coconut addict. So naturally, as I had a half open can of coconut milk laying around a few weeks ago, I knew exactly what I needed to recreate. 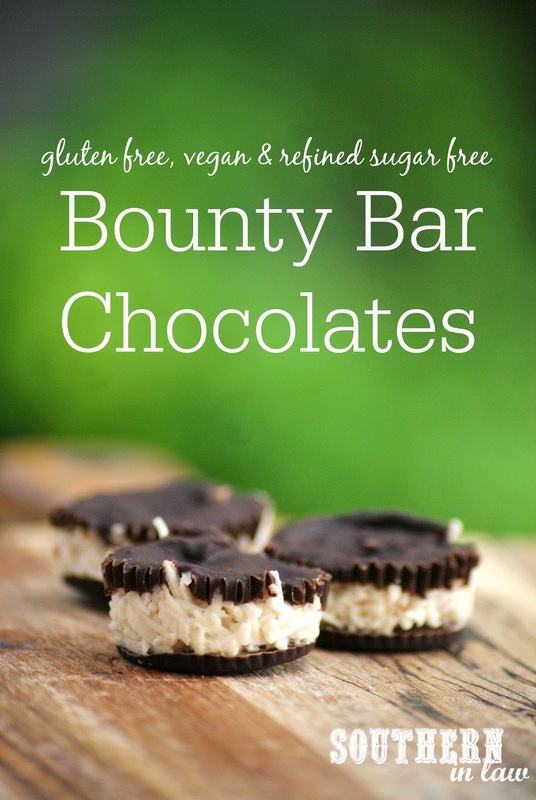 A bounty bar - but a healthier and much more delicious version than the original. I decided on Bounty Bar Chocolate Cups as I wanted the filling to be creamy and perfectly coconutty and that was perhaps one of the best decisions I've ever made. Be warned though, you will not be able to stop at just one. But it's okay, because they're healthier - and gluten free and vegan and refined sugar free - how could you say no to that?! So on that note, let me give you the recipe! In a heatproof bowl, melt your coconut oil and mix with your other ingredients. Divide half of your chocolate shell mixture amongst your prepared tins and place in the freezer to set for 10-20 minutes. 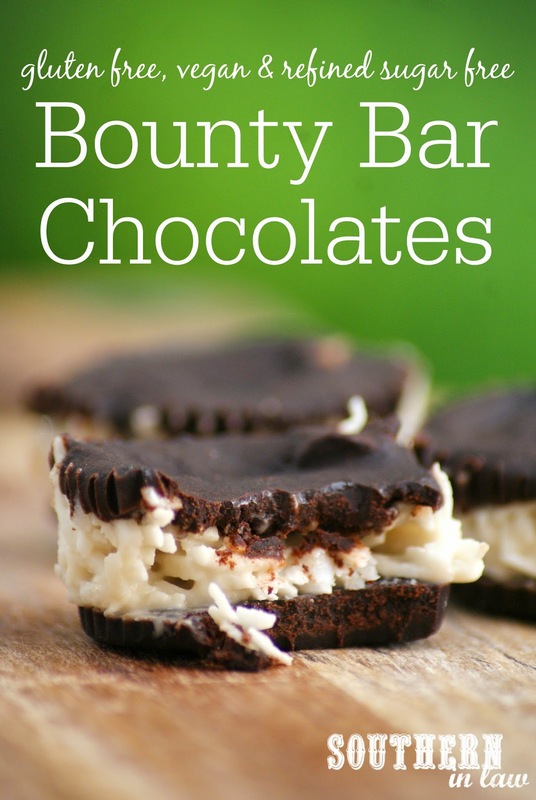 Once your chocolate base has set, mix together your coconut filling and spoon it into your tins. Pour your remaining chocolate shell mixture on top of your coconut filling and chill in the fridge until set (or freeze if you want them to set faster!). Once set, you're free to enjoy! You'll want to keep your Bounty Cups in the fridge or freezer as they'll start to melt once they get warmer! But tell me, are you a coconut fan? What was your favourite chocolate bar as a child - and what's your favourite chocolate treat now? I have ALWAYS loved coconut! My mom on the other hand does not...I can't understand why! Haha, I think it's one of those things you either love or hate - like cilantro!